1. Is your Supplement Program out of Control? Is your horse getting more than 4 supplements a day? If so, I would suggest you step back and ask what each supplement is for and if it is actually helping. For instance, has your joint supplement allowed your horse to move more freely or do you just use it because your think it may be helping. Has your hoof supplement really improved the quality of your horse’s hooves? Has your lung support product stopped your horse’s chronic cough? Is your horse’s skin more shiny with the latest coat conditioner you added? Did you see the attitude change you were hoping for when you started an ulcer treatment product? Does your horse finish up all his supplements or does he leave a pile of uneaten powder or pellets at the bottom of his bucket? Feeding multiple supplements can be detrimental to your horse and your pocketbook. Overlapping ingredients can throw minerals out of balance or in some cases lead to toxicity. Flavorings, binders, and preservatives in supplements must be processed through the horse’s detoxification systems. Wasted supplements are a sure sign your horse is not liking what you are offering. Rethinking your horse’s foundational nutrition and temperament type may allow you to cut back or eliminate unneeded supplements. Part of the foundational diet for a horse should include the best quality feed available and a nutrient dense food such as blue green algae to replace the vitamins and phytonutrients not available in hay. Pre and probiotics are important, especially for horses under stress. A blue green algae/probiotic/antioxidant formula is ideal to make sure the horse gets all nutrients he would normally get from a native grass pasture. It would be nice if a good foundational diet would prevent all health issues but unfortunately horses that are energetically out of balance won’t rebalance with food alone. Stress from training, confinement, showing, or extreme weather all cause the horse to use some nutrients more than others. The temperament of the horse determines what nutrients are needed in larger amounts during times of stress. A horse in the wild will forage for the exact nutrients needed to bring his system back into balance. When the specific nutrients needed to combat stress are not available the body can’t function efficiently and this leads to health issues. The Five Temperament Balancing formulas are designed to replace the specific nutrients needed by each type when he is stressed. When the balancing formulas are combined with a good type based, whole food, foundational diet far fewer disease conditions will develop. Temperament typing your horse is one way to cut way back on unneeded supplements. The best quality whole food ingredients should be the foundation for your horse’s health but not all foods are ideal for each type. Once you know your horse’s temperament you can feed him the diet that is best suited for his metabolism. The best foods for each type can be found at www.horsetemperament.com. Preventing health issues from developing is the best way to avoid the out of control supplement program. 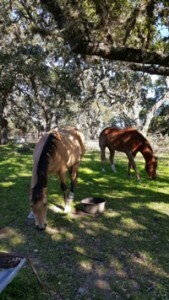 This entry was posted in Five Element Feeding, Five Element Personality Typing, Newsletters and tagged holistic horse care, holistic horse health, horse, horse temperament, horses on January 15, 2017 by Madalyn Ward, DVM.